It’s that time of year again when I ask myself as a Jew if I prefer Christmas to Hanukkah. Historically, my family has NEVER, EVER had a Christmas tree. As a child I dreamed of one. When we lit the lights on the Hanukkah menorah, I imagined those lights were silver balls with singing angels. I envied my friends whose houses had chimneys and sugar cookies shaped like reindeer. Once when I was 11, I went to Rite Aid and bought a 20 dollar plastic tree. It was a miniature, not even two feet tall. I hid it in the garage and decorated it with pink and blue balls and tinsel. The squirrels must have gotten to it because the day after I hid it I found it knocked on its side with half the tinsel on the ground and half of the balls a shattered mess. When I embarked on my journey in an interfaith family, it wasn’t because of the jealousies of Christmas. Instead, it was because the man of my dreams, the person I consider to be my soul mate, Adrian, isn’t Jewish. He’s Mexican Catholic – that means VERY CATHOLIC in layman’s terms. In fact, the first time I ever visited his apartment when we were dating, there was a rosary with a wooden cross that hung from his mirror and when it wasn’t on his mirror it was around his neck, a gift from his mother. After almost seven years together and our two little daughters, that cross has come to hang next to a statue of the Virgin of Guadalupe (a holy saint in Mexico much like Mother Mary), and those two things share a shelf with my book of Tehilim (Hebrew prayers), Shabbat candle holders (for the Jewish Sabbath) and none other than a golden Menorah given to us by my mother. Yet, our babies are still small so we are still learning how to navigate the holidays. Our apartment is small too and when I started hanging Hanukkah AND Christmas decorations this week, it seemed as though Old Saint Nick stuck Old Saint Hanukkah in a corner and took over the living room with Christmas cheer. But, I’m not going to lie, that was my doing. I can’t even say that Adrian had anything to do with it because Adrian doesn’t need decorations of Christmas cheer to celebrate his holiday. For Adrian its about his love of God and family; for me its about hitting the dollar section at Target and finding out how many ornaments are too many. But, there is something to be said for Jewish guilt. 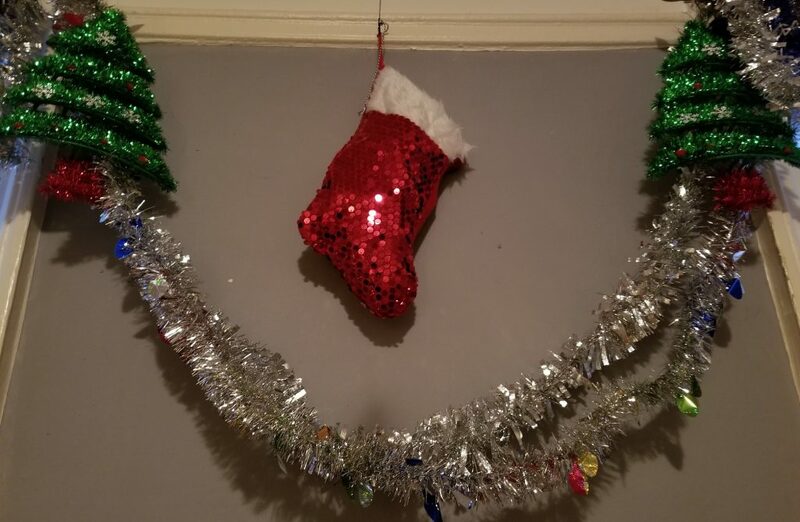 After Hanukkah got bullied into the corner by my half priced glitter snowmen, I needed room for the sequin stocking – because it’s not an interfaith Hanukkah/Christmas without a sequin stocking. 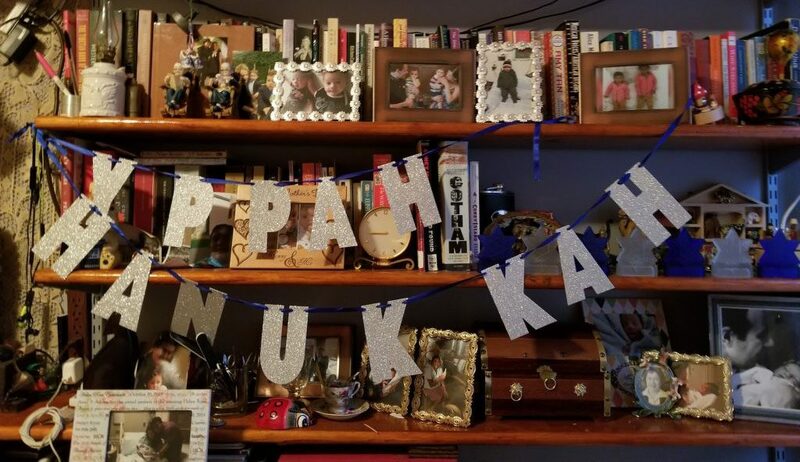 However, in order to hang the sequin stocking, I had to…and let me pause before I write this in the hopes that Hashem (the Jewish God) doesn’t send a lightning bolt through my Christmas sweater right now…I had to take down the Hebrew alphabet letters I have been teaching Helen. I know! Listen, as I peeled the Aleph (the first and most powerful Hebrew letter) off the wall I felt years of ancestral Jewish guilt. I almost couldn’t do it. I almost put it back. But, something shiny caught my eye. I was like Moses as a child reaching for gold in front of the Pharaoh, hoping an angel would come down and move me over so I could put my hand in a bowl of fire instead and speak with an eternal lisp. No angel came. That shiny stocking enticed me and commanded me to rip those Hebrew letters off the wall. Let it be known that on the opposite wall there is ANOTHER Hebrew alphabet. There’s also a Hebrew alphabet on the fridge. But, there was something about THAT Hebrew alphabet that made me wonder what my punishment would be. What endless karmic cycle would I end up in because I couldn’t resist the gaudiness of Christmas? It gets worse. At Amazing Savings I chose bags that said “Joy” instead of bags that said “Oy.” That’s right, for all of my coworkers I bought CHRISTMAS GIFT BAGS. I mean, I hand knit interfaith ornaments with Hannukkah colors, but they were still ornaments nonetheless. In the pharmacy, when Helen, my 3-year-old, asked me if she could have a lollipop, I suggested a candy cane instead. Adrian ran out of socks and I just happened to have an extra pair with reindeer on them. Last night I put on a Christmas music mix and had a happy cry after a Michael Buble number. What am I going to do next week for the latke party at my brother’s house? I feel like if I don’t get my Hanukkah/Christmas spirit (which is really just Christmas spirit) under control, I might end up shaping my latkes like fat little Santas. Maybe next year I will try to make my Hannukkah corner more spectacular. But, for now, I will have to wrestle with my addiction to everything green, black, red and shiny. Besides, can God really punish me that much for wanting to spread joy, not oy? Maybe it’ll be OK when God sees my dreidel ice trays, the one new Hanukkah thing I bought. << Previous: How Will Our Kids Understand the Past?